I recently read two books on remote work. 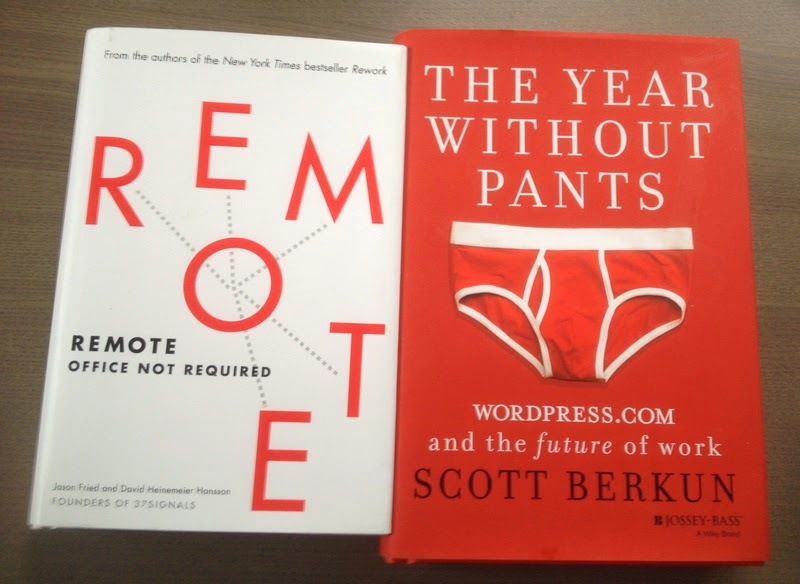 Scott Berkun’s Year without Pants and Remote: Office Not Required by Jason Fried and David Heinemeier Hansson. The first book describes Scott Berkun’s year as a remote manager at Automattic, which runs WordPress.com. The second book describes the authors’ experiences at the fully distributed company 37signals, which has since renamed itself to Basecamp to reflect the importance of its flagship product. Both books were interesting reflections on the nature of remote work in the context of their respective companies. They were not books that addressed the nature of remote work in general, but described the approach they felt was successful within their companies. Of the two books, I would really recommend reading the Year Without Pants. Remote isn’t as compelling but it’s a short read. Chapter 4 on culture always wins is is a fantastic read, it’s available for free on his website. In other words, treat people like grown ups and they will do good work. Wow, this is very significant. If you are the most powerful person in the room, speak up and call out bad behaviour. The people with less power are often hesitant to speak up because there may be consequences for them and they feel they lack authority. I often get questions from people who don’t work at home how I don’t get distracted and goof off all day since I work from home. It’s simple. I love my job. It’s a lot of fun. I want to be shipping, not slacking. Shipping every day gives people a sense of accomplishment. Many bug fixes are deployed to WordPress.com every day. No gatekeepers to deployment but the people deploying the change are expected to watch the site after they deploy for a few hours to ensure there aren’t unexpected problems. The book suggests asking managers or employees to work from home a few days a week to level the playing field with respect to communications between employees who work in an office and those who are remote. This will ensure they appreciate what hinders communication and take steps for improvement. And it will reduce the tendency to treat remote workers as second class citizens and cut them out of essential conversations. Again, trust people and have high expectations of them and you’ll be rewarded with excellence. The authors note that international exposure is good as a selling point with clients. Hiring around the world increases the talent pool available, but is not without tax or legal complications. Also, given the degree of written communication with remote work, it’s best to hire people with the language skills that can thrive in this situation. The book stresses that workflow tools need to be available to all team members at all times in order to be productive. i.e. recording the state of a project in a wiki, bug tracker and recording meetings. If a team member is working in a timezone offset from the majority of team members and doesn’t have this in place, it can be a productivity drain. Absolutely. I learned so much working in open source for so many years. The authors also mention that you’ll have to worry about your employees overworking, not underworking. Because they office is physically in your home, it’s easy to get sucked in at all hours to just work on one little thing that takes longer than you expect. Work for a company with strong culture, tools and process that support remote work. Mozilla is a great example, there are many others. It’s not optimal to be the only remote worker in a company that has no experience or culture that supports distributed collaboration. Get up, shower, eat breakfast and put on clothes you wouldn’t be ashamed to seen in outside the house. Despite the title of the book I reviewed above, this means wearing pants. I think it’s helpful that I have people on my timezone that I collaborate with on regular basis. I think I would find my job much more difficult if this was not the case. Do stuff to get out of the house on a regular basis – visiting friends, family or regularly scheduled activities such as sports or hobbies. Otherwise, you will become, as Laura Thomson so eloquently put it a “lonely code hermit”. This isn’t healthy. Talk about stuff not directly related to code with your coworkers so you have some rapport for them as people outside the context of work. Meet up with your team in person on a regular basis. At Mozilla releng, we do this three or four times a year. As much as irc, bugzilla, wikis, video conferencing and other tools are great for collaboration, there isn’t anything that can substitute for talking in person. Also, it’s great for getting to know them more as people. And when you know them as people, you are more willing to help each other and feel more cohesive as a team. Ship. If you are worried that you don’t appear to be productive because you aren’t physically in the office, ship awesome stuff. Then nobody cares where you’re sitting and you get to have a 30 second commute. If you work in software, you aren’t constrained by geography to determine the kind of job you can have. If you don’t want to work for the software companies that have offices in the town you live in, you have a choice to choose a better job. Life is too short to get up every day and work at a job you don’t like. There’s a lot opportunity for those who work in many fields to work remotely. As aside, I was supposed to be at a Mozilla work week in Portland this past week. But I didn’t fly there because I came down with a bad cold. Despite this, I could connect to the same room the they were in and see all the talks they were giving and also give a presentation. This was so excellent. Since we are so used to being a distributed team, having one person remote when we were supposed to be all together wasn’t a problem. We already had the culture and tools in place to accommodate this. Thank you Mozilla releng for being such an amazing team to work with. My idea for another book on remote work would be to have one with the format where there were about 10+ chapters, each written by an employee from a different company about how they approach it, what tools they use and so on. I think this could be a very interesting read. What do you think are the keys to successfully working as a remote employee?